Amazon Kindle Lite Quiz Time & Kindle Starter Quiz – Answer 5 simple questions and win Rs 5000. Quizzes have become a quite common occurrence on Amazon App wherein users just need to answer few simple questions and they get to win exciting prizes. 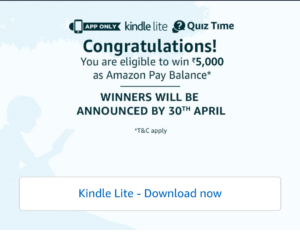 Today on 31st March, Amazon is back with Kindle Lite quiz time in which on answering 5 questions correctly, you will be entitled to a lucky draw and 40 winners would be given Rs 5000 for free of cost. For your ease, we have also added all the answers to the 5 questions below. Please check and participate in this contest. You never know when your luck will play its part. Do not miss to check the Winners List of Amazon Quizzes of March month. 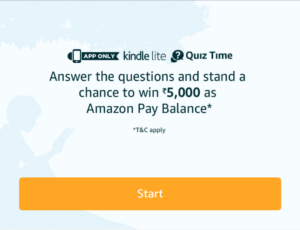 1 Amazon Kindle Lite Quiz Time Answers & Win Rs 5000? Amazon Kindle Lite Quiz Time Answers & Win Rs 5000? 2. Open the app and you will see a banner about the Kindle Lite Quiz Time contest. Click on it. 4. You will now see a set of 5 questions about the Kindle Lite specs, some ficitional questions. Check the answers below. Q1) What is the download size of the Amazon Kindle Lite listed on the Google Play Store? Q2) On the Kindle Lite app, you can start reading an e-book before it finishes downloading. Q3) Books in which of these languages are currently NOT supported on Kindle? Q4) How many eBooks are available on the Kindle Store in India? Q5) Which of these is NOT a feature of the Amazon Kindle Lite app? Q1) Which of the following can you NOT do on a Kindle eReader? Q2) How long does the battery on a Kindle eReader device last? Q3) Other than the Kindle e-Reader device, which of these does the Kindle starter pack NOT include? Q4) What is the eBooks discount offer which you currently get with the Kindle Starter Pack? Q5) All Kindle eReaders have an anti-glare screen. 1. This Contest will commence on 31st March from 12:00:01 a.m. (IST) to 20th April 11:59:00 p.m.
5. The draw of lots will be carried out during the Contest Period for the questions and a total of 40 (forty) participants will be selected as winners by a random draw of lots. 6. The declared winner(s) will be eligible for winning 5000 Rs each as Amazon Pay balance. 1. This Contest will commence on 31st March 2018 from 12:00:01 a.m. (IST) to 25th April 11:59:00 p.m .
5. The draw of lots will be carried out during the Contest Period for the questions and a total of 14 (Fourteen) participants will be selected as winners by a random draw of lots. A total of 14 (Fourteen) participants will be selected as winners of the Contest. 6. The declared winner(s) will be eligible for winning 1 unit of Kindle Starter Pack (hereinafter referred to as “Prize(s)”). How can we know who has won the contest? Meri jis email id se mera amazon ka account khula h.. vo chlti nhi h.. but mera jo vha registered mobile number h.. vha message kr dena winner ka.. Registered mobile no. Pr message notification daal dena. What about tweet….I need to make a tweet on #kilndleanniversaryquiz?